My girls LOVE this skirt! I have made this scallop edge skirt twice and I am starting a third. It fits 2 of my girls and they take turns wearing them- usually as soon as possible after laundry day. Super quick and easy to knit and so cute and comfortable. Caron simply soft is my favorite line of yarns, but I have found red heart soft holds up better for this piece. Comments for My girls LOVE this skirt! 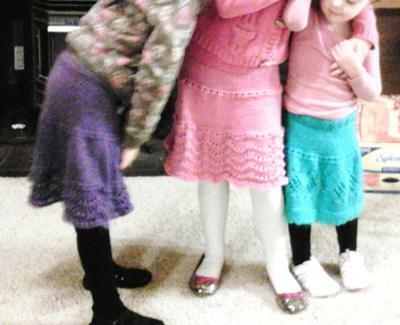 Thank you, for sharing the photo of the skirts. Look like the girls are having great time wearing them and showing them off together. That's so wonderful! The colors are all go very well together too. I love that you made a diaper cover and attached it to the toddler skirt. What a great idea, cleaver mom! Thanks again for the picture and the story that goes along with it. It's nice to know what other knitters think about my patterns and even better when the girls are appreciated what you made for them. I love it! Hope you and your family and the girls had a wonderful Summer.